Our highly-specialized Fluoride Master system utilizes high-grade FluoriSorb™ media and is designed to effectively filter fluoride (commonly found in city/municipal water supplies), sediment and/or particulate matter from all of the water entering your home for about 400,000 gallons or 4-6 years**. 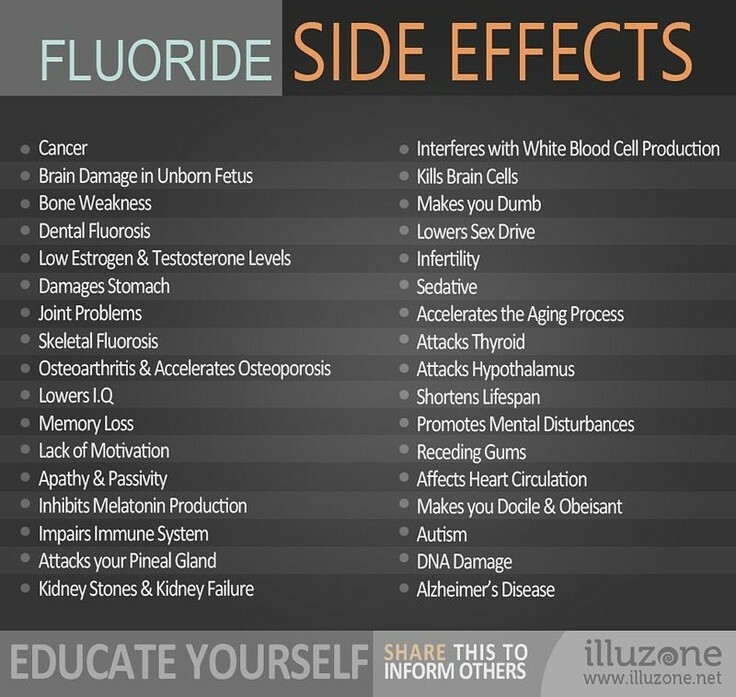 The FluorideMaster™ system utilizes approx. 60 pounds of high-grade FluoriSorb™ media (known as Hydroxyapatite/Bone Char) which is considered to significantly outperform other fluoride reduction media such as "activated alumina". The FluorideMaster™ does not contain any "activated alumina". * Lifetime warranty consists of: 1) 10-year defect-free warranty on materials and workmanship involving the tank and tank head components; and 2) Lifetime prorated warranty on the system media based upon the lower value of the advertised media lifespan range as specified in the system's specifications chart. ** The lower end value of the 4-6 years media lifespan range is based upon the average annual water usage of a household of 3-4 people. 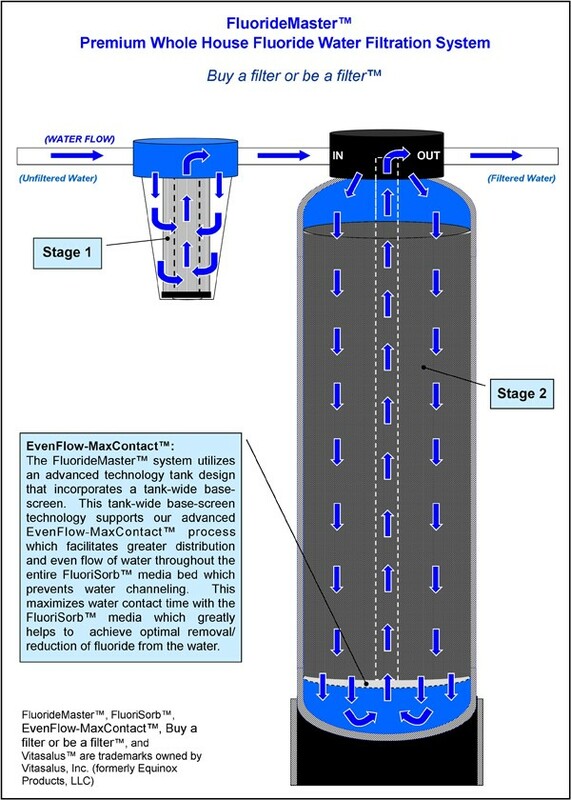 Our highly-specialized Fluoride Master system utilizes high-grade FluoriSorb™ media and is designed to effectively filter fluoride (commonly found in city/municipal water supplies), sediment and/or particulate matter from all of the water entering your home for about 400,000 gallons or 4–6 years**. The FluorideMaster™ system utilizes approx. 60 pounds of high-grade FluoriSorb™ media (known as Hydroxyapatite/Bone Char), which is considered to significantly outperform other fluoride reduction media such as "activated alumina". The FluorideMaster™ does not contain any "activated alumina." ** The lower end value of the 4–6 years media lifespan range is based upon the average annual water usage of a household of 3–4 people. "Howdy, I installed the FluorideMaster fluoride water filter you custom built for me. I'm a water treatment operator at Ft Richardson, Alaska. I did a fluoride sample last night, raw well water was .99mg/l Product water after fluoride filter was ZERO. Thanks for a fine product!!! 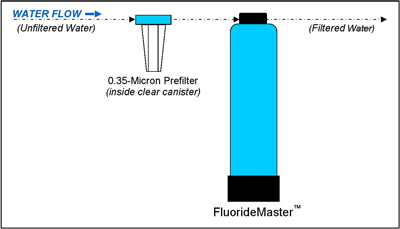 :)"
The FluorideMaster™ is shipped Pre-Assembled (tank comes pre-loaded with high-grade FluoriSorb™ media) and Ready-To-Install which greatly simplifies the installation process and significantly reduces installation time and cost. 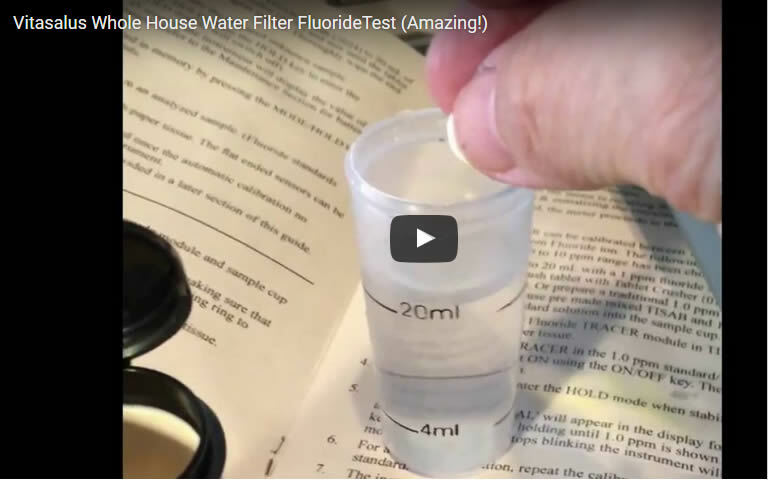 The FluorideMaster™ is easily the highest quality and most affordable premium whole house fluoride water filtration system available in the marketplace today. Complete System: Includes the Ready-To-Install FluorideMaster™ System (blue tank unit) plus an installation kit which includes a 0.35-micron prefilter used to filter out potential copepods, cysts, sediment and/or particulate matter down to 0.35 microns in size. Replacement System: Includes only the Ready-To-Install FluorideMaster™ blue tank unit with filtration media and inlet and outlet head. Replacement Media: Includes only the FluorideMaster™ high-grade FluoriSorb™ fluoride water filtration media necessary within the blue tank unit and a filter media filling/refilling funnel. NOTE: The Replacement Media option is for existing FluorideMaster system owners. cigarette smoking is dangerous to your health." You may not smoke, but we all consume water. Doesn't it make good common sense to protect yourself and the ones you love today while doctors and the health industry debate public health risks? How may we further help you with the FluorideMaster™? PLEASE NOTE: If you're also concerned about addressing chlorine, chloramine, sediment and/or particulate matter, cysts, copepods, Volatile Organic Compounds (VOCs), Synthetic Organic Compounds (SOCs), THMs (Chlorine by-product), PAHs (Chloramine by-product), trace heavy metals (i.e. lead, mercury, or iron), MTBEs, atrazine, benzene, xylene, pesticides, insecticides, herbicides, tastes, odors and hundreds of other potential contaminants and harmful chemicals from the water entering your home, then you may want to consider adding the FluorideMaster & PureMaster Combo Package, which includes the PureMaster V-Series (V-300, V-500 or V-700) Whole House Water Filtration System. NOTE: All FluorideMaster™ systems are shipped Ready-To-Install and include necessary fittings for 3/4" (standard) and 1" plumbing installations. Shipping is FREE for shipments to customers within the continental USA. For customers outside the continental USA, shipping is FREE up to $100 and if shipping exceeds $100, customers will be contacted with total shipping costs for final approval before order is processed. The FluorideMaster™ Whole House Water Filtration System utilizes high-grade FluoriSorb™ media and is designed to effectively filter fluoride (commonly found in city/municipal water supplies), sediment and/or particulate matter from all of the water entering your home and effectively performs for about 400,000 gallons or 4–6 years. The Fluoride Master™ system utilizes approx. 60 pounds of high-grade FluoriSorb™ media (known as Hydroxyapatite/Bone Char) which is considered to significantly outperform other fluoride reduction media such as "activated alumina". The FluorideMaster™ does not contain any "activated alumina." Shipped Pre-Assembled (tank comes pre-loaded with special media) and Ready-To-Install which greatly simplifies the installation process and significantly reduces installation time and cost. No chemicals, electricity, drain-line or media regeneration required. No maintenance required on the main system—only 0.35-micron prefilters need be replaced approx. every 6 months to extend the life of the system and ensure optimal system performance. Rust proof wound fiberglass polyethylene tanks feature 125psi operating pressure. Includes our industry-leading, 100% Customer Satisfaction Guaranteed Warranty including: 4-Year prorated warranty; plus a 1-Year Defect-free warranty on materials and workmanship. Thank you!, Review by Allison S.
This is a Thank you! Praise You! Note. You are part of the great and fantastic companies trying so hard, even going 120% to help lift up and heal America. 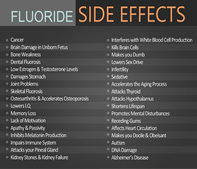 We absolutely must get rid of Fluoride out of our water and out of all of the food that is canned. What is worse is that we are shipping this to other countries. You know all of this. Please, can we now take it to the people? Now is such a political time and the focus is on the health of our nation and on The People's Health. Our country needs to get back to being healthy. The Heroes and the Champions of America will be the ones who can stand out against any and all harm. They will be the true winners. Our attitude is: who can be against anyone who helps keep America healthy and takes OUT all of the chemicals that make us very sick and fat? You are True Heroes 4 America. YOU should be lifted up in praise and encouraged, even awarded. Can you pass this on? 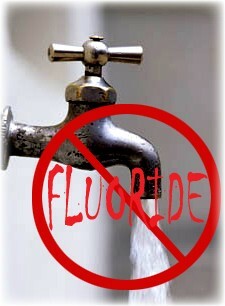 We all need to come together and stop The Harm: No more Fluoride! Not for US-ALL and Not for any other country. Extremely happy with the PureMaster V-700 and FluorideMaster, Review by Susan R.
We are extremely happy with the PureMaster V-700 and FluorideMaster Premium Whole House Water Filtration Systems, and the prompt, helpful customer service we've received. Water pressure was a concern of ours, and we noticed no drop in pressure after the system was installed. We are enjoying the freedom of being able to drink water from any tap in the house, instead of from a water filter installed at the kitchen sink. The water is clear and delicious without the chlorine smell it had in the past. And somehow the bath water now has a lovely shade of blue. Our plumber installed shut-off valves on either side of the filter system - highly recommended for ease of use.